If you are looking for a place with plenty of golf and even more places to stay, look no further then than the Waikoloa Beach Resort, located north of Kona on the Big Island. There are two courses to choose from, with the King’s and Beach courses, plus there are over 3,000 room options, varying from in two upscale hotels and seven condos and vacation home properties. There is a Hilton property and Marriott property both on the Resort. site and the The Hilton Hotel features a chance to visit and swimming pools, swim with a dolphins lagoon, plus a chance to take a tram or boat to your room after check in. 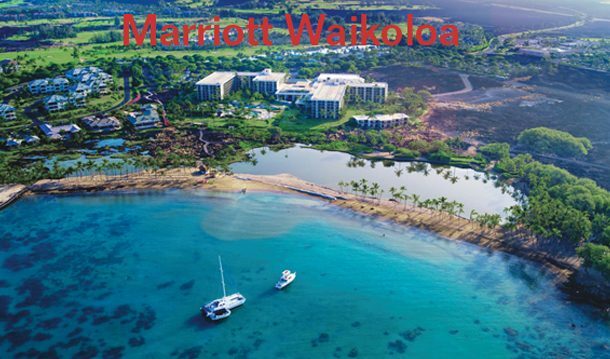 The Marriott Hotel is located on the beautiful Anaehoomalu Bay where one can enjoy sunsets, plus wander through the ancient Kuualii and Kahapapa Fishponds. Waikoloa Beach Resort is a vast property. It sits on 1,350 acres and has more than 30 dining options, two shopping centers, the two golf courses, two resort hotels and plenty of entertainment and outdoor activities. The resort has landed in the top 10 as a “Top U.S. Destination for Vacation Rental Stays” according to Trip Advisor. What makes the resort special is it’s The Queens’ MarketPlace and Kings’ Shops, both complete with varieties of shops of all variety plus and restaurants. The golf courses are both popular. The King’s Course (Robert Trent Jones Jr.) and Beach Course Tom Weiskopf and Jay Morris) both feature shots through the lava and many holes with ocean and dramatic views. The Beach course lives up to its name with some holes with terrific views of the Pacific Ocean. Packages are as low as $218. For more see www.waikoloabeachresort.com for more information on the resort.